The nice thing about Cravings is that it's always a refreshing experience upon entering another branch. 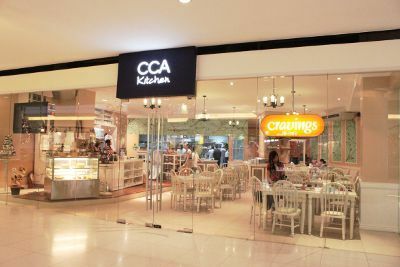 So is the case when I first visited their latest installment: CCA Kitchen/Cravings at the third floor of Eastwood Mall. The Cravings group, as we all know, is a veteran in the restaurant scene. If the food and dining industry had a family tree, the group would most likely belong some levels near the apex, with 20 plus years of restaurant experience and a dozen or so branches under their belt. 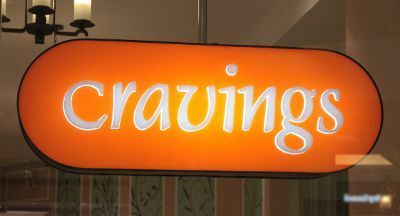 Although the branches would often carry a familiar feel, each and every Cravings outlet has always been unique in its own way. It's bright. It's young. It's fun. 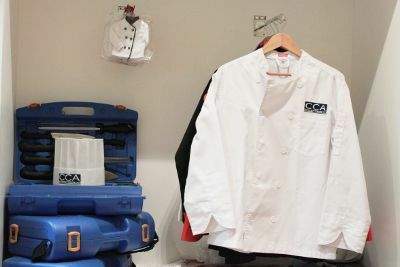 CCA Group's latest addition to the family, found at the third floor of Eastwood Mall, showcases a bakeshop, culinary school, deli, chef's botique, and restaurant under one roof. And unique, CCA Kitchen is. Bright and cheery-hued, this satellite kitchen of the CCA group did not quite register to me as Cravings when I first saw it from the other side of the mall. It did not have the familiar walls in shades of red and orange. Instead, they were off-white, accented by powder blue panels with curvy, nature-themed prints. Very comforting, yes? I found its country style all-white furniture endearing, making an already spacious room appear even brighter. 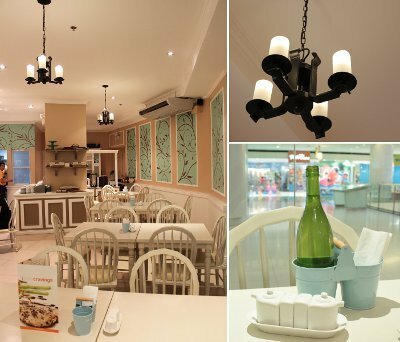 This refreshing choice of interior design cleverly serves the resto well as it avoids clutter and chaos in this nook, where there are many things going on at once. 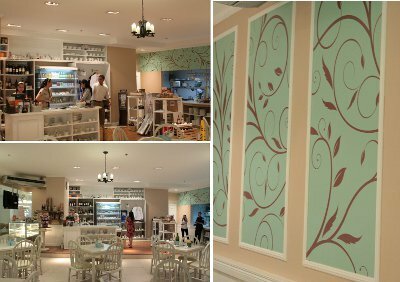 After all, it's a bake shop, culinary school, deli, chef's botique, and restaurant in one! To the left of the area is their counter and deli platform, where hard to find kitchen utensils and CCA chef uniforms are also being sold. 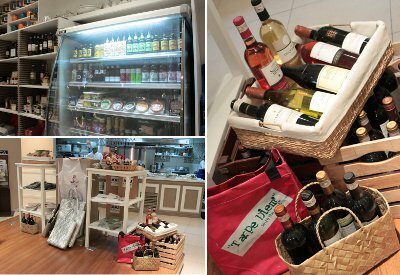 Offerings in their deli are limited but quite enough to hold prime brands of cold cuts, cheeses, and wines. Right across the entrance is a busy kitchen, opened bright and wide for everyone to see. Most Cravings branches keep their kitchens hidden at the back. The open kitchen is an addition that is most welcome. I don't know about you, but I fancy open kitchens as it allows the O.C. (obsessive-compulsive) part of me to see how my food is being prepared. 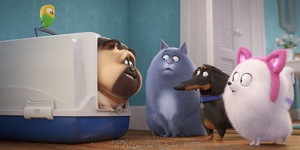 A little bit of trivia: that movie Ratatouille made me such an O.C. diner! Anyway, aside from the pleasant change in their interiors, I was also informed that Cravings recently overhauled their menu. To quote their Chef de Partie, the flavor is "edgier and more aggressive." It has been a long time since I last visited Cravings (I frequent its younger sister C2 more often), so I visited the restaurant for lunch. Making frequent rounds in malls (one part of my job) is bound to make one go hungry. That particular day's lunch consisted of Caramelized French Onion Gratinee (P90), Pan Roasted Salmon Fillet with Warm Miso Broth (P405) and Rosemary and Mint Lamb Steak with Rich Red Wine Butter Sauce (P400). 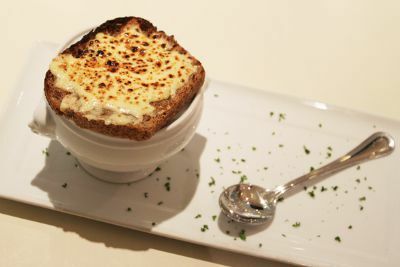 The soup, which is a noted best-seller, consists of slow-cooked onion strips (two medium sized onions, I'm guessing) swimming in sweet, peppery broth, topped with wheat bread au gratin. Comforting isn't enough a word to describe how soothing this dish is. It's even ten times better with the soft bread soaked for a while until it's almost flabby. Aaaah, how I wish I can have this at home everyday! Great, great choice for a starter. Simply magnifique! 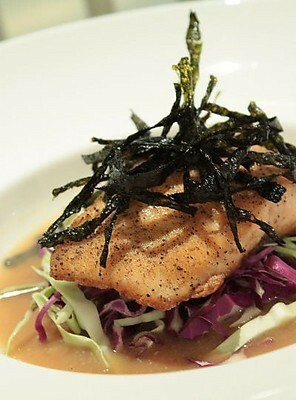 The Pan Roasted Salmon Fillet with Miso Broth did not disappoint as well. 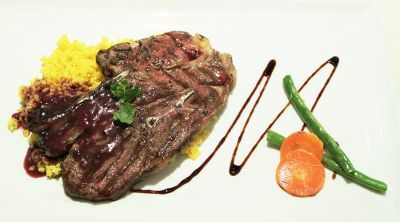 If the first dish was classy and French-y, this one is strongly Asian. 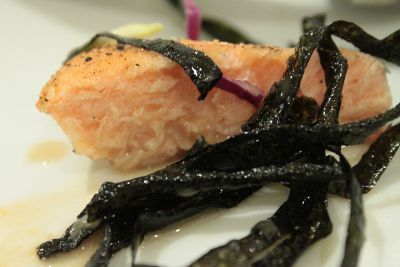 The palm-sized three-fourths inch thick salmon lies atop green and red cabbage strips, making it slightly elevated from a shallow serving of miso broth. Miso flavor was subtle -- not too pronounced as the nori crusting artfully placed on top of the fillet. But altogether, the dish presents interesting mix of Asian flavors and textures. I'm just not too sure if I'd recommend it for hungry people, considering that they could order the next item (much, much heavier) for about the same price. 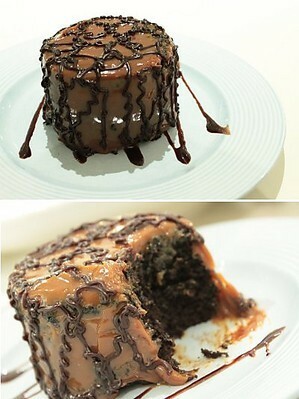 Let me just say that this is advised for healthy eaters. 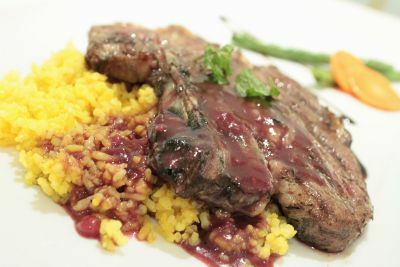 Last but not the least is the Rosemary and Mint Lamb Steak, with Rich Red Wine Butter Sauce. Its name obviously speaks for itself (names as elaborate as this make my job much easier, ha ha!). The dish is good enough to fill up one hungry person, or two light eaters. Take note however that the wine sauce is pretty concentrated for an average diners' liking. 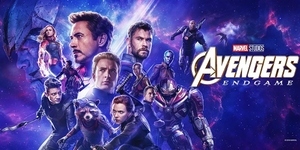 Expect it to be strong and outright bitter. Either you spread it thinly on the slab (not on the rice as it doesn't go well together), or just skip the sauce if its to powerful a taste for you. And since we're in Cravings, a meal is not a meal without their signature Chocolate Caramel Cake (P95), one of my all-time favorites! 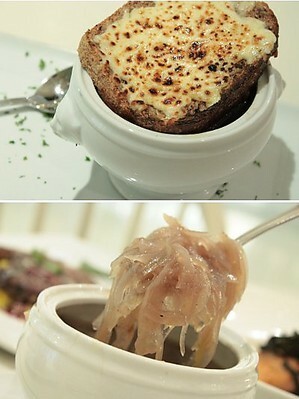 Satisfied with our meals, we proceeded to our purpose, which is to inquire about the short courses offered for summer. 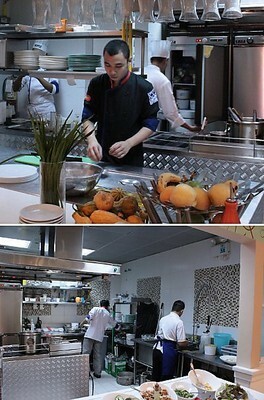 The satellite kitchen as we were told, offers professionals and newbies a variety of short cooking courses targeting almost all age groups. There's Jumping Jambalaya and Food for the Boys for dads; Thai and Italian Cooking classes for moms who want more formal training; pizza and pasta making for kids; sushi, tapas, mixology, chocolates and French cuisine for the yuppies; as well as Food Photography and Food Writing for foodies and food bloggers. I'm personally eyeing the mixology and tapas classes. I still have to check if my schedule permits. Schedules and rates vary so better inquire personally about the particular class you'd like to attend. Inquiries regarding the short courses can be placed at tel no. 994-25-20, 30 and 40, marketing@cca-manila.com or visit www.cca-manila.com.